Is Cliffs Natural Resources Destined for Greatness? Miners have been hit hard by commodity price slumps, but Cliffs might have a better chance at climbing out of its hole than many peers. Investors love stocks that consistently beat the Street without getting ahead of their fundamentals and risking a meltdown. The best stocks offer sustainable market-beating gains, with robust and improving financial metrics that support strong price growth. 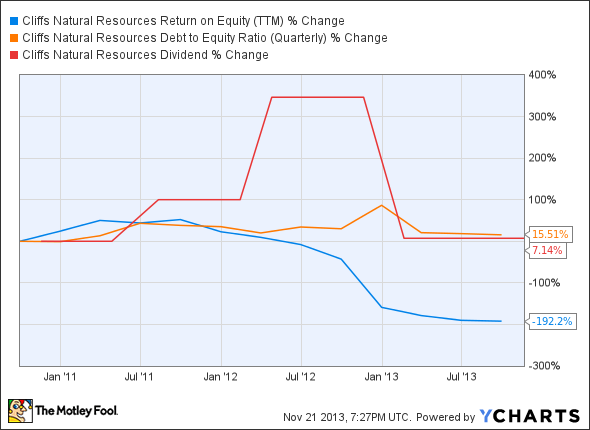 Does Cliffs Natural Resources (NYSE:CLF) fit the bill? Let's look at what its recent results tell us about its potential for future gains. Things don't look good for Cliffs Natural Resources in its second go-around, as this diversified miner has lost three out of five passing grades it scored on last year's assessment. One passing grade was merely a technicality because free cash flow declined at a less rapid rate than net income, but both of these metrics have been in negative territory for some time. Cliffs' revenue growth, its lone apparent bright spot, has been on a downward slope since last year because of persistent cost pressures and unfavorable macroeconomic conditions. Is there any hope left for Cliffs today? Let's dig a little deeper to find out. Over the past few quarters, Cliffs has been battling with falling coal and iron ore prices, largely a result of China's slowdown in natural resource use. This demand drawdown has led Cliffs to drastically reduce its capital expenditures and dividend payouts in order to maintain some cash on hand. However, iron ore prices have recently improved by about 17% to $130 per ton, and this helped Cliffs beat expectations (which were quite low to begin with) in its third quarter earnings. According to the International Monetary Fund, Chinese GDP growth is expected to be remain high -- between 7.5% and 7.7% this year -- which should theoretically sustain steel demand in the Middle Kingdom, which should help hold the line on prices for Cliffs' iron and met coal exports. Fool contributor Rupert Hargreaves points out that Cliffs is likely to benefit through its competitive market position in China which is expected to produce a record 770 million tons of steel this year. Cliffs' aggressive combination of expansion plans and cost-cutting measures should help it to revive its sagging fortunes now that global demand for iron ore is starting to surpass combined supplies once again -- Rupert Hargreaves also notes that the recent jump in shipment volume from Australian iron ore terminals has not satisfied current levels of demand. Cliffs has been focusing on core operations to cut down its operational costs and long-term debt, and that's starting to show with notable improvements in the company's iron-ore cash cost, which improved by nearly 4.4% and 5.7% in Eastern Canadian and U.S. mines. Fool contributor Vladimir Zernov notes that Cliffs has been preparing a second phase of expansion at its Bloom Lake Mine, which may cost around $450 million. To fund this growth, the company suspended its $3.3 billion chromite project in the far north of Ontario, which has already absorbed approximately $500 million in costs. In contrast, coal-focused mining companies Arch Coal (NASDAQOTH:ACIIQ) and Alpha Natural Resources (NASDAQOTH:ANRZQ) have had a hard time implementing their cost-cutting alternatives in the face of dwindling thermal coal prices throughout the world. Thermal coal is now priced around five year lows of $50 per ton, and a growing domestic backlash against "dirty coal" has not helped improve this segment's prospects, and that's likely to be the primary drag on Cliffs' profitability in the future barring an international demand surge. However, coal producers have recently challenged the Environmental Protection Agency's CO2 emission regulation in the Supreme Court, which could help restore some demand for thermal coal at utilities. If this legal gambit works, Cliffs could be on the path back to profitability sooner than many investors expect. 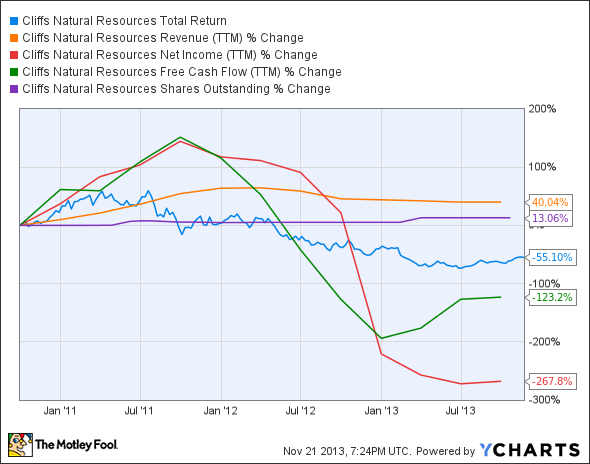 Today, Cliffs Natural Resources has few of the qualities that make up a great stock, but no stock is truly perfect. Digging deeper can help you uncover the answers you need to make a great buy -- or to stay away from a stock that's going nowhere.